Hashtags are mysterious for many. We all know we need them. The real question for some is why & how? With the Instagram algorithm rewarding users for their engagement and using all its features, it’s crucial to have a solid understanding of optimizing your hashtag game. Barely Using Hashtags: The more hashtags you use, the better your chances are at being discovered. Instagram allows for up to 30 hashtags on a post. Use them all to take advantage of this opportunity to be found. Overly Descriptive OR General Tags: Often the tags used are not search-friendly with overly descriptive tags such as #ThisIsMyFavoritePizzaPlace or popular over-saturated tags such as #food. Aim for mid-sized tags that are relevant to what you offer and the interests of your niche audience. Repeating Hashtag Blocks In Every Consecutive Post: It’s great if you’ve found tags that work for you however there’s always new ones to explore and every post should have a few different tags. 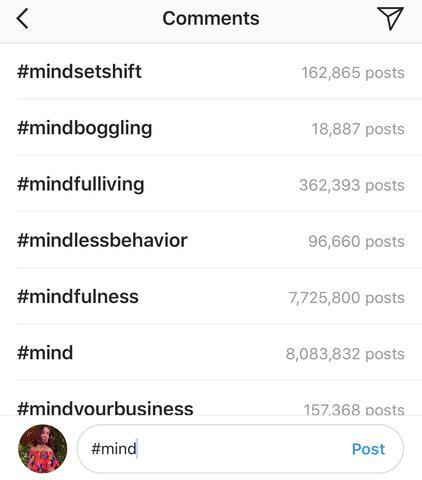 Not only is it a smart practice to gather new data on new tags but also if you use the same set of tags for every single post then the Instagram algorithm is likely to classify your activity as a spam account. The below guidelines are a tested & proven ways to level-up your Instagram hashtag game. Implement these and tailor them to your needs as you monitor their performance on each post. If you haven’t already performed market research, perform some in order to pinpoint competitors and similar accounts. Once you’ve completed this, observe what the tags are in some of their top performing posts. Save a few of them that could apply to your content as well in order to gauge how they work out for your account. The larger the tag, the more competition there is to be seen. There’s nothing wrong with competition. The issue lies in the fact that popular tags will likely bury your post since they are over-populated. This is why I highly suggest, based on my own research, to start using tags with under 500K uses. Feel free to sprinkle in tags with 1M+ uses but don’t overdo it. In order to know if a tag is working, one of many things you can start by doing is tapping the tag a few hours (or a day) after posting to see if it landed on the trending page. When you visit the Miami Design District you become aware through the street art, business cards and even employees about their #atMDD tag. Therefore, if you take an Insta-worthy shot at Miami’s Design District you know that besides using a geolocation tag and tagging their Insta profile you should also use their #atMDD tag. Using the hashtag associated with a product, service, location, event or latest trend could help boost your discoverability and even getting a repost with a shoutout! Be aware of these things whether you visit an exciting event and want to snag the opportunity to be featured on their feed or stories or there’s a trending tag going around. Brands are always on the lookout for customer created content so making sure your post is easily discoverable is a major plus for both you and for them. Hashtag groups allow you to avoid the tags you have researched from becoming messy all grouped into one massive visually frustrating blob. Groups are sets of hashtags grouped into a category so that you can easily mix and match, copy and paste from that group when you make a post pertaining to that category. You can build groups with as many or as little hashtags as you want. Say you own a social media studio, the groups could be separated by broad and more targeted categories. Broad categories such as “marketing” will likely have more tags but its specific subcategories such as “digital marketing” might have just 5 to 10 strong tags to select from. Another example is the “social media” category which might hold as many as 20 to 30 hashtags to pick and choose from but would also have subcategories for social media where we group tags for all Instagram, Facebook and Twitter related posts into their own section for easy tag selection. Eventually, making notes on your phone and copy/pasting them becomes a tedious task as your business work piles up. In order to save even more time, I highly suggest a social media scheduling platform to help you save posting time. Things to look for in a scheduling platform are its ease of use, good analytics for what you need, and the ability to observe competitor content from within the app is a nice plus. I highly suggest Later because it allows you to search hashtags as you type within the platform. Hashtags aren’t just for posts. Your stories can accommodate as much as 10 tags per story. This will give you the opportunity to appear on the story for some (or all) of the tags you used. Usually, stories that land on the featured story for the tag have generated engagement relatively quickly soonafter being posted thus granting them a spot in the featured section. You should’ve had a branded hashtag by yesterday. But that’s ok, every day is a new opportunity, so get to work on that right now. Your brand’s hashtag will always be the first tag to appear in any post. It’s also a great way to encourage the creation of user-generated content. There is no such thing as a comfort zone with social media strategy. What works today might not work as well in three months and might not yield results at all in the following year. Due to the ever-changing social media landscape, adopting an experimental mindset embracing new trends is key. This goes for everything, not just hashtags. Now go and get social putting what you learned here into practice! Hey, I’m Diana and I’m a social media manager & graphic designer with 7+ years of experience. I help brands express themselves on social media through storytelling & design to attract their ideal audience.